I am fairly certain I've eaten a version of this meatball dish for lunch or dinner at least 5 times over the past couple weeks. Possibly even more than that. With a little prep, it's such a simple recipe. The chicken meatballs can be made and baked in advance, then kept frozen for fast meals on those days when you can barely handle more than a few minutes of waiting for things to heat up. 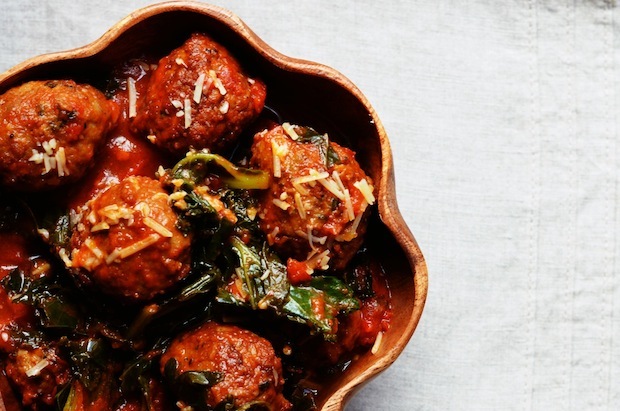 To make the final dish, simply combine the chicken meatballs with your favorite tomato sauce (homemade or jarred--I'm obsessed with Rao's Arrabiatta sauce) a little broth and a huge handful of kale. Let simmer and serve. So easy. So good. 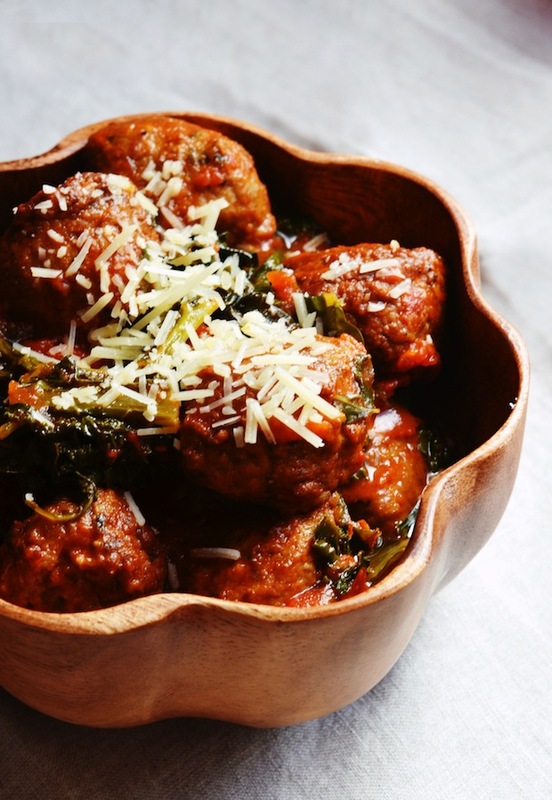 You don't even need pasta because the kale turns into the perfect base to soak up the sauce, and the meatballs are packed with flavor. This also works with other meatball recipes, so feel free to substitute your favorite (or use one of my other recipes like this awesome Turkey Bacon Meatballs or these Pepperoni Meatballs). Preheat oven to 400 degrees F. Combine bread and milk in a large bowl until soaked. In a medium skillet, heat 1 tablespoon olive oil and add the onion and garlic. Saute until softened, then add to the bread and milk mixture along with the ground chicken, cheese, parsley, salt, pepper, and oregano. Divide into 24 meatballs and arrange on baking pan. Bake 20 minutes, or until cooked through. 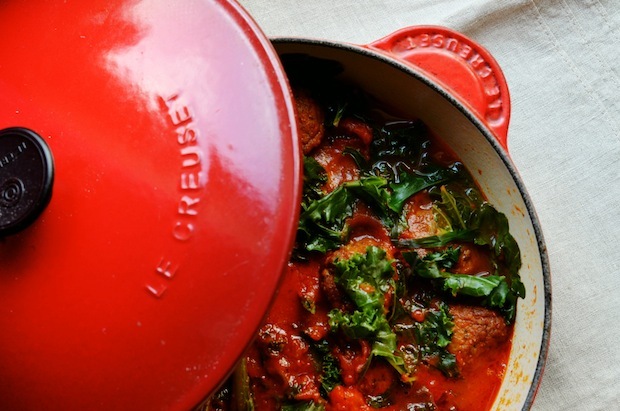 Combine meatballs with sauce in large pot over low heat, add broth and cover with kale. Cover pot and let simmer 10-15 minutes, or until kale is tender and sauce has thickened. Stir once, then serve topped with parmesan cheese.